A planet just 124 light years from Earth has an atmosphere shaped like a balloon… thanks to an abundance of helium, according to new research. The inert gas, best known for being used to blow up party balloons or make people’s voice squeaky, is escaping in a cloud. The helium is being blasted out by radiation from the alien world’s scorching hot star. It is 20 times closer to its star than the Earth is from the Sun, they explained. Dr Jessica Spake, of the University of Exeter, said: “This is a really exciting discovery, particularly as helium was only detected in exoplanet atmospheres for the first time earlier this year. She said the helium is in an extended cloud that is escaping from the planet. Helium is the second most abundant element in the universe. It was only discovered 150 years ago by a French astronomer who noticed a yellow line in the sun’s spectrum while studying a total solar eclipse. The planet, about the size of Neptune, has been named HAT-P-11b. It lies in the constellation of Cygnus. The remarkable breakthrough was made using a scanning device called a spectrograph installed on a 13 foot ground telescope at Calar Alto, Spain. It measured how much light the planet blocked from its host star when it passed in front of it. Helium was first successfully found in the atmosphere of an exoplanet, which is a planet outside our solar system, earlier this year in a study led by the University of Exeter. The ground-breaking study published in Science could open up new understandings of the extreme atmospheric conditions found around the hottest exoplanets – alien worlds outside our solar system. Devon-based astronomer Norman Lockyer named helium after the Greek Titan of the Sun, Helios. It has since been discovered to be one of the main constituents of the planets Jupiter and Saturn. It was long- predicted to be one of the most readily-detectable gases on giant exoplanets. But it was only successfully found in an exoplanet atmosphere earlier this year, in a pioneering study also led by Dr Spake. Romain Allart, PhD student at the University of Geneva and first author of the study said: “We suspected that this proximity with the star could impact the atmosphere of this exoplanet. 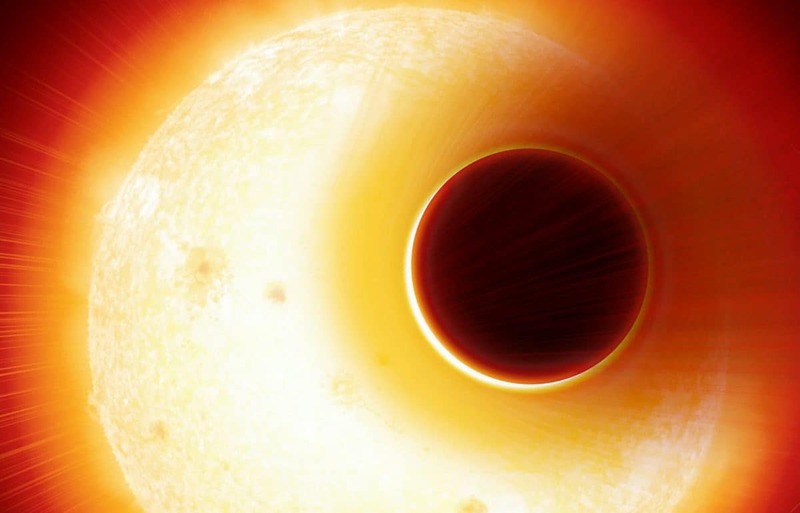 The first detection of helium earlier this year, led by University of Exeter researchers, opened a new window to observe the extreme atmospheric conditions reigning in the hottest exoplanets. These new observations from Carmenes demonstrate that such studies, long thought feasible only from space, can be achieved with greater precision from ground-based telescopes equipped with the right kind of instruments.